Well Woven Modern Damask Area Rug - 3'11" x 5'3"
Update any setting with this contemporary area rug. 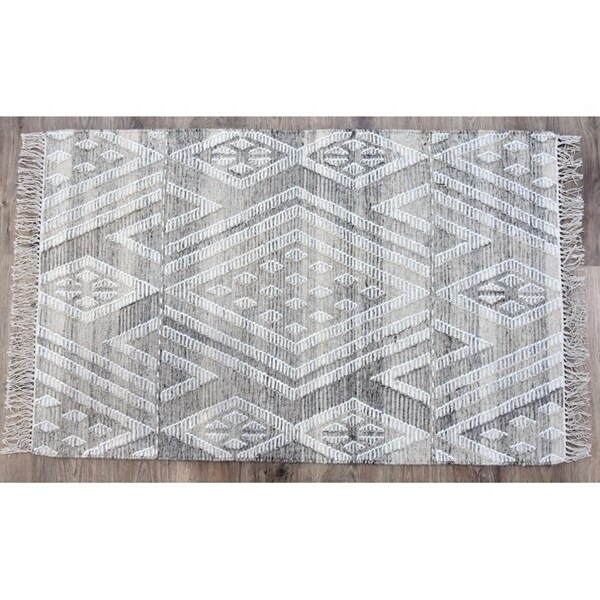 It has a rustic, authentic look inspired by traditional kilim patterns. Hand-Knotted with wool and cotton, this abstract area rug is sure to be the finishing touch you've been searching for. 80% Wool/20% Cotton Pile Height: 0.25 - 0.5 inch Every piece is one of a kind. Product Care & Assembly Shedding of looses fibers is normal and is natural result of the process used to create hand woven wool rugs. Do not pull loose ends. Clip them with scissors to remove. To prevent dust and crumbs from settling into your rug, vacuum regularly and/or shake. Professional rug cleaning recommended. Blot spills immediately with a clean cloth. Tip: We recommend the use of a non-skid pad to keep the rug in place on smooth surfaces. Dimensions 60.0 In. X 36.0 In. X 0.25 In.